Some misguided individuals believe that Christmastime is the most wonderful time of the year. Not. Even. Close. 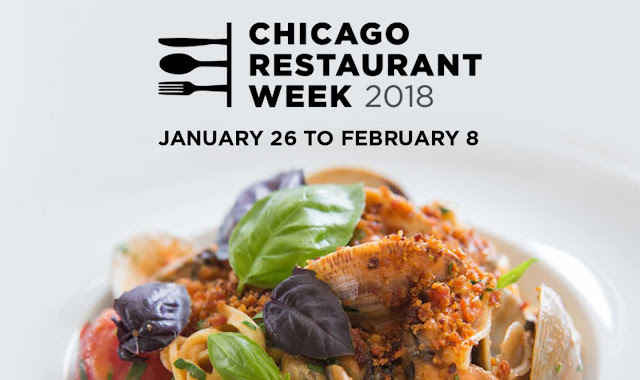 The best time of the year in Chicago would be the roughly two week period (some restaurants extend it and participate even longer) designated as Chicago Restaurant Week. It typically begins in January and continues in to early February, a traditionally slow time for the restaurant industry. People are often dieting in conjunction with New Year's Resolutions, funds are low because of the holidays and people are more apt to hibernate at home during the brutal weather in Chiberia in winter. But, if you can overcome those things, it is a great time to visit one of close to 400 participating restaurants offering multi-course prix fixe meals - lunches at $22 and dinners at $33 or $44. You usually have an option of at least two entrees, appetizers and desserts. Some will have other upgrades or wine pairings that you can tack on if you'd like. Beverages and gratuity are not included. You'll find many varieties of ethnic cuisine offered at dining establishments of all kinds. If there's a pricey, swanky place that you've always wanted to visit that is just out of you budget, you might find them on the list of restaurants and have a chance to dine there when you wouldn't normally go. It's a great way to be introduced to new places that you may not otherwise try. I'm a fan of steakhouses and here's an example for you: Fleming's Prime Steakhouse and Wine Bar is participating and for $44 you can get lobster bisque, a filet and cheesecake (there are other options as well.) Or visit Rick Bayless' Xoco for a gourmet Mexican lunch for $22 and choose such dishes as classic ceviche or Sopa Azteca for an appetizer with Chiliquilles Yucatecos for an entree and a plate of dessert crepes to finish off. Chicago Restaurant Week extends through February 8, so make your plans and expand your horizons and excite your palate! Go to ChooseChicago.com for all the details!